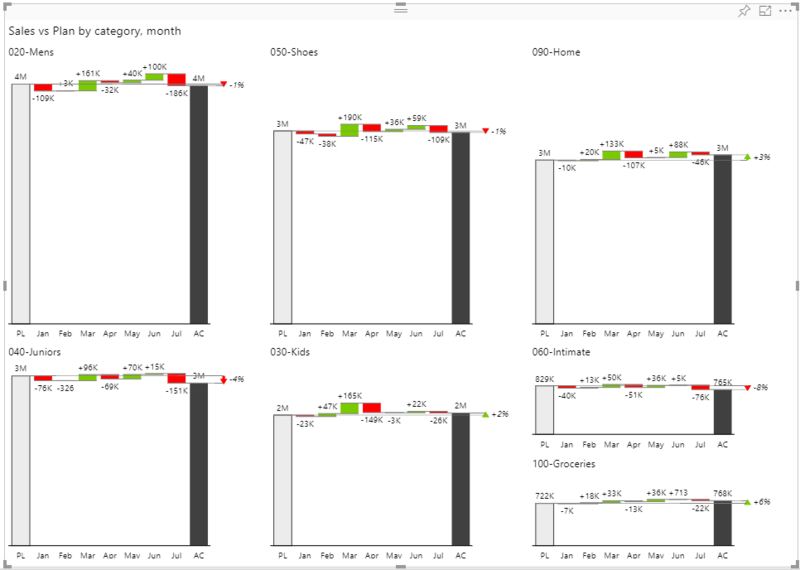 The Zebra BI PowerCharts visual features a "chart slider". To use it, simply hover over the visual and you'll see two arrows (< and >) on left and right side of the chart. Click on them and enjoy your data visualized with a different advanced business chart. Zebra BI visuals for Power BI are the world's first fully responsive BI visualizations. The visuals will automatically adapt to the content presented and the available space. You can change the calculation of variances and difference highlights by clicking directly on the labels. In the Zebra BI PowerTables visual just click on the column header to sort by the respective measure, presented in the column. If you're doing that on a hierarchical table, a multi-level sort will be applied automatically (across multiple levels simultaneously)! #5 Our favorite: Small Multiples! Introduced by J. Bertin and popularized by E. Tufte, the small multiples are considered one of the most powerful data visualization methods. 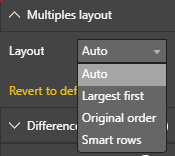 That's why Zebra BI visuals for Power BI contain the most advanced algorithm for rendering multiple scaled charts among BI software so far. The allocation of space is carefully optimized so that the values are presented in the clearest possible way. 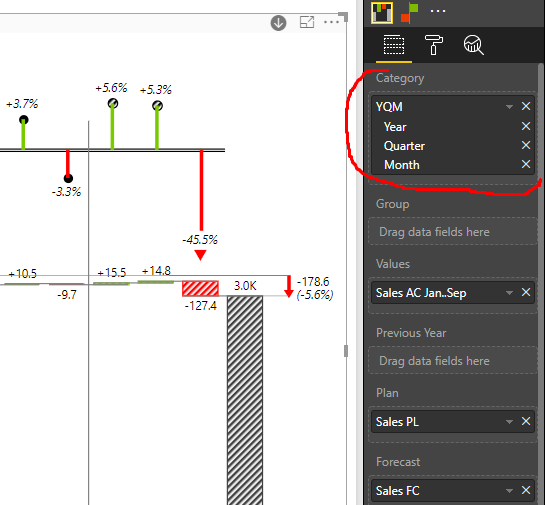 One of the most frequently requested features in business reporting is just one click away in Zebra BI visual for Power BI! It gets even better, the axis break works in small multiples layout as well! In the hierarchical tables you can also expand/collapse rows by clicking on the row arrows. You can add unlimited number of levels and show exactly the ones you want. Zebra BI custom visuals for Power BI are fully compliant with Dr. Rolf Hichert's IBCS (International Business Communication Standards). The IBCS standard design notation is rendered by default, without the need of adjusting any kind of settings. The typical business scenarios like actual (AC), plan or budget (PL, BU), forecasts (FC) or previous year (PY) are automatically coded with standard patterns. 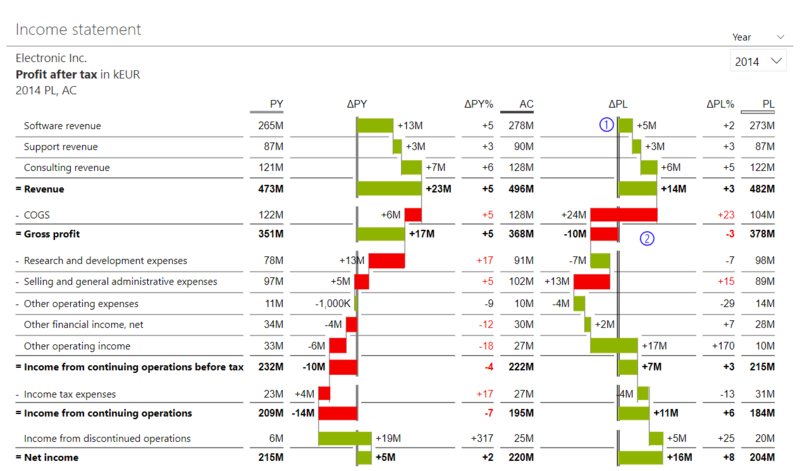 The variances are presented in intuitive plus-minus, lollipop or waterfall charts. Even the tiniest details, such as the difference highlights, outlier indicators, semantic axis, etc. are automatically rendered in pixel-perfect accuracy. 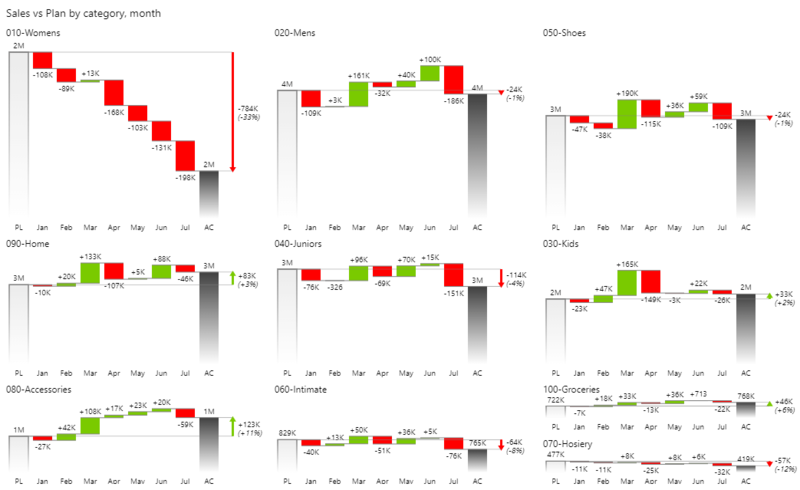 #9 Segmented charts – visualize your forecasts! Segmented charts allow multiple comparison points in the same chart., which is an especially suitable option for displaying forecasts. Drill-down allows the users to ad-hoc analyze the variances and other important values in charts. Expand all elements down one level in the hierarchy. Note the additional animated 'drill-down tile' that appears at the top of the Zebra BI visual, clearly indicating which elements were selected for the drill down. Want to create dashboards like these in your Power BI?